While it blows its predecessor out of the water in the looks department, the Yoga 3 Pro has too many flaws to justify the slightly too high price point. A triumph for design, but little else. The Yoga 2 Pro was arguably the finest convertible Ultrabook money could buy when it launched in late 2013 - and it continues to impress today. It was sleek, packed a best-in-class QHD+ display and could transform into a multitude of positions depending on how you wanted to use it. Update 21/5/2015: Lenovo has swapped the Intel Core M5Y70 on the original Lenovo Yoga 3 Pro for a newer Intel Core M5Y71. The latter has a slightly higher base/boost clock speed (1.1/2.6GHz vs 1.2/2.9GHz) so you get a bit more oomph. This hasn't trickled to the UK though till now. The company has also cut the price of the cheaper model from £999.95 to £799.95 in the UK after a £200 cashback offer with places like John Lewis offering a three-year warranty. Note that there is also a new BIOS update that was rolled out only a few days ago. At $1,099 (£1,099, around AUS$1,254), it was also relatively affordable compared to competing Ultrabooks boasting displays with high pixel densities. On the flip side, its battery life, unwieldy tablet mode and lack of 802.11ac Wi-Fi meant that there was still plenty of room for improvement. By addressing these concerns, I could see Lenovo returning with a smash hit on its hands. On paper, the Yoga 3 Pro promises to be just that, with one look at the spec sheet revealing a machine for fans of both convertible machines and Ultrabooks in general to lust after. One of the first devices to arrive with Intel's new Core M "Broadwell" processor, which succeeds the company's battery-sipping Haswell architecture, it has catwalk-thin dimensions and comes in a trio of colours: Golden, Orange Clementine and Light Silver. It has a designer (and not to mention brave) price tag to match, starting at $1,299 (£1,299) for the entry-level model with a 256GB SSD. That rises to $1,699 (UK and AUS price TBC) for the top-spec offering, which doubles storage capacity and comes with the Pro, rather than regular version of Windows 8.1. Cost also varies (somewhat inconsistently) depending on which colour you choose; you can view the full line-up on Lenovo's website. There are a few notable competitors in that price bracket. One is Microsoft's Surface Pro 3, which will set you back $1,299 for the 256GB / Core i5 version, and Apple's 13-inch MacBook Pro with Retina, which costs the same for the 128GB / Core i5 model. Then there's the Yoga 2 Pro that, following a price drop that has seen it fall to just $849 (around £530, or AUS$969), now represents serious value for money. Although it's engineered towards gaming, another option to consider is the Razer Blade, which we reckon is one of the best-crafted Windows laptops of all time. One of the Yoga 3 Pro's most striking features is its watchband hinge, which has been crafted from more than 800 individual pieces of aluminium steel, according to Lenovo. There are now six hinges, compared to the Yoga 2 Pro's two. They add a retro twist to an otherwise modern design, and in addition to oozing elegance they occasionally emit the sort of satisfying clink you might hear when slipping on an expensive timepiece. 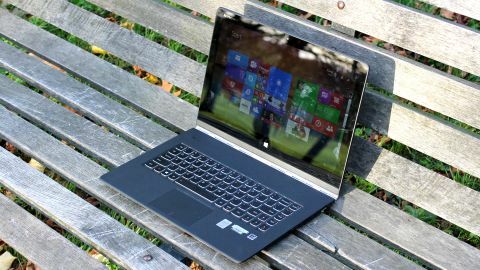 Windows 8 Ultrabooks have for some time struggled to escape the shadow cast by Apple's MacBook Air, but Lenovo has found a way to stand out without aping the Cupertino company's well-familiar design aesthetic - and it's refreshing to see. But it's not fashion for fashion's sake: the new hinge design makes the device sturdier than the not-exactly-flimsy Yoga 2 Pro, and Lenovo says that it also enabled its engineers to slim the device down to the point that they did. That hinge allows you to flip the lid 360 degrees into one of four different modes: standard Laptop, Tent, Stand, and Tablet. Next to Laptop mode, Tent is perhaps the most useful because it takes up the least room on the surface area and makes it easier to interact with Windows 8.1 apps. I took the Yoga Pro 3 on a trip and found that the Tent position allowed the device to double as an attractive alarm clock when positioned on the hotel's bedside cabinet. The other modes have their uses too; Stand provides the same benefits as Tent while providing more rigidity, and Tablet, a bugbear on the Yoga 2 Pro due to that device's thickness, is easier to handle on the Yoga 3 Pro due to it being thinner, lighter and slightly longer in the body than the outgoing machine.